I have somehow always had a fascination for tarot cards ever since I first came across them. I even dream of writing a fantasy story centered on tarot cards. However I am by no means the first to come up with such an idea. ‘Card Capture Sakura’ is an anime with this theme and I was obviously fascinated. The series also has a manga version but apparently there are some differences in the story between the manga and anime. This series is actually a Shojo manga which means it mainly targets girls, the protagonist as the name suggests being a girl called Sakura. While I had an option of taking up Yugi-Oh, another series around cards, targeting boys, I somehow felt I liked this one better and decided to showcase this one in my first anime showcase series. Also this is one of the few lighter animes with hardly any deeper existential themes or darker shades. The story centers around 53 magical cards created using a combination of Western and Eastern magic by a half Chinese-half English magician called Clow. The cards have two guardians – Cerberus who holds the power of the sun and Yue who holds the power of the moon. Each card comes under the domain of one of the four elements – earth, wind, fire and water or the two attributes – light and dark, which are cards themselves and answer to the authority of one of the guardians. 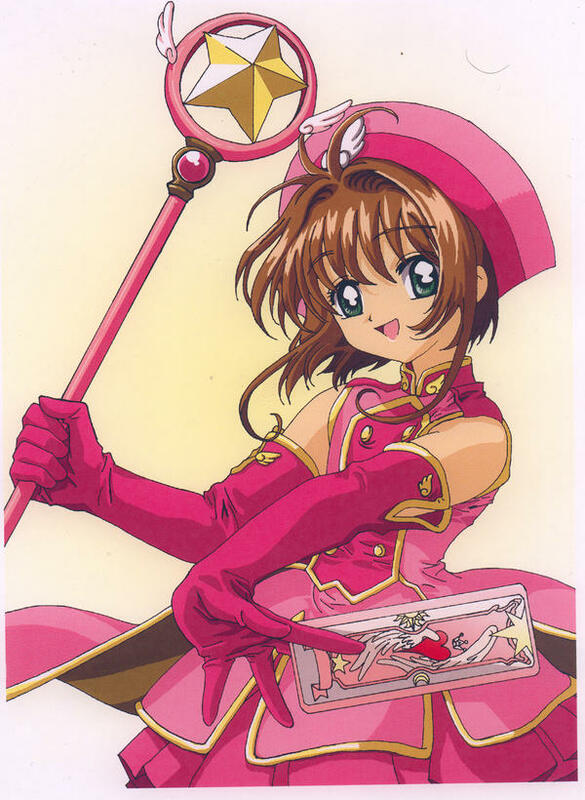 The story begins with Sakura, a descendent of the legendary Clow finding and scattering away the cards from their imprisonment within a book through the use of one of the cards ‘Windy’. The rest of the story follows her efforts to recover the cards one by one and gain control over them. The cards when released gain a life of their own and use their powers to wreak havoc on the world. So it falls on Sakura as the guardian to use the power of the cards she has under her control to defeat the free cards one by one and add to her collection, which makes her more powerful when dealing with the next card. Aiding her in her quests, is one of the guardians: Cerberus based on the three headed dog guarding the gates of the underworld in Greek mythology. The storyline as such is quite simple. We have the girl hunting the cards amidst the drama of regular school life – friends, crushes, teachers, studies etc. We also have rival card hunters turning up to further liven up things and their interactions with her. We also eventually learn of the origin of the cards and their creator. But that is quite simplistic and did not hold much fascination for me. What really kept me hooked was the anticipation of what would be the card every next episode, its powers and how Sakura would capture it. Other thing I liked about this story is the lack of any real evil characters or presence of any serious mortal danger to the protagonists. While that tends to make it bland, sometimes simple things have freshness to them that one seeks them every now and then. I found this series to be very relaxing to watch amidst hectic work for a difficult term paper for which I had to pour through close to a hundred books. This is not a typical anime and I would not call it one of my top favorites. But still it has its own charm and its own distinct flavor. I would recommend this to anyone looking for a light time pass watch without stressing one’s mind or emotions too much. True, Suresh. Sometimes too simple things fail to hold the attention while at other times one wants it really simple. The storyline seems definitely intriguing. If there was only one you could recommend to somebody totally new to this genre, which one would that be ? Would like to watch one and see. Are these series only in Japanese? Do you have to read sub titles? We them in English also. But it does not sound half as good as the original Japanese with sub titles.